Higher gas and electricity bills helped to push UK inflation up to 2.2% in May, from 2% the month before, official figures have shown. The move means that the Consumer Prices Index (CPI) rate of inflation has now risen above the government's 2% target. The headline rate of RPI inflation, which includes mortgage interest payments, rose from 2.6% to 3%. Despite the rise in inflation, analysts played down the prospects of an early rise in UK interest rates. On Monday, Bank of England governor Mervyn King warned that the global economy was facing a "bumpier" time. Worries about rising levels of inflation around the world, which may lead to higher interest rates, have hit global share prices in recent weeks. UK share prices fell sharply on Tuesday morning after Asian markets - in particular, Japan's Nikkei - plunged on worries over the possible impact of higher US interest rates. Last week, UK interest rates were kept on hold by the Bank of England at 4.5% for the 10th month in a row, but the expectation is that the next move in rates will be up. 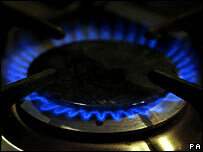 The inflation figures from the Office For National Statistics (ONS) said the largest upward effect on inflation in May came from higher gas and electricity bills, following recent price increases. Food prices also contributed to the rise, mainly as a result of higher vegetable prices. The price of clothes and shoes also rose - reflecting, the ONS said, higher-priced replacement stock this year and more widespread sales a year ago. Transport costs fell as a result of cheaper domestic and long-haul flights, but this was offset by the rise in the price of petrol. Despite the rise in inflation, analysts said the figures were unlikely to bring forward any possible rate rise by the Bank of England. "We continue to believe that interest rates will remain unchanged through to 2007," said Howard Archer at Global Insight. "Recent comments by Mervyn King suggest that he is currently in no hurry to tighten monetary policy." Geoffrey Dicks, chief UK economist at RBS, noted that the energy and petrol price increases had been in line with expectations, and that it was "hard to justify" an early rise in rates. Speaking to business leaders in Scotland on Monday night, Mervyn King warned that the economic climate had become more uncertain in recent months. "After a period of robust economic growth, we approach a somewhat bumpier stretch of the road," Mr King said. "A rebalancing of global demand is desirable, but the way ahead may not be smooth," he added. However, he said that UK inflation was "not of serious concern as yet".